I have word both from Diamond and ASP that the long delayed Issue 4 of Mouse Guard will be in stores Nov 26th! 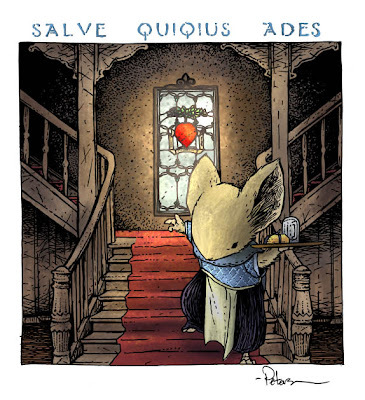 This is my favorite issue to-date, has my favorite cover, and features Mouse Guard music! Speaking of which, as I mentioned on my blog before, Jesse Glenn (the real life Kenzie) not only wrote the music for me to scribe a ballad, but once I was done, he recorded a version of it with him singing three-part-harmony! I will make the MP3 available here next Wed. once the issue is in stores. So re-read Issues 1-3 of Winter (you may need the refresher, I certainly did!) and check back here Wed. for that special download. 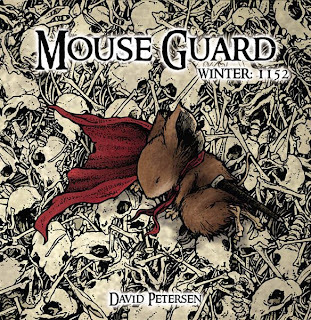 Another note on ASP and Mouse Guard. The latest release date for the RPG is Dec. 24th, and the Limited Ed. Slipcase B&W hardcover is slated for release at the New York Comic Con in Feb. I can't thank fans enough for not only taking a chance on a odd-shaped book about mice with swords, but also for being so patient and loyal. I have heard from many of you offering support and kind words when the book was in publishing limbo. Trust me when I say that it meant a great deal and helped me through a frustrating and stressful time. Hopefully that is all behind us now, and I can focus on just telling the best story I can and hopefully entertaining you fine folks in the process. So if you are an old fan, or just joining us: Welcome. "All Who Come Are Welcome"
I was close to giving up when I realized my four year old daughter hadn't asked me to read "Kenzie"--her title (also Kenzie is a girl in her world)--in several months. She'll be glad to hear we'll see it soon. Btw will there be a way for us not attending New York to get the b/w slipcased RPG book? For instance, do you think it will still be available by the time San Diego rolls around? Douglas: The events of issue #4 will leave your daughter a bit confused if she continues to think of Kenzie as a girl. Also thanks for not giving up! Mayhem: The b&w ed. will be limited to 1000 copies. Stores should be getting them in Feb. If we have any in San Diego will depend on how well we sold them by hand in NY and how well they are selling in stores. great that everything has been ironed out on the publishing side. can't wait to read issue 4 this wednesday. will check out the rpg when it comes out. by the way, enjoyed the back up story you did in house of mystery - great story and art by you and bill. Great news - hopefully this means you're all sorted with ASP/ whoever now? On the B&W, do you know if it will be re-solicited through Diamond, or will existing orders stand? Looking forward to Thursday (in the UK, so 24 hrs longer!). Thanks for the answer David. Amazon are listing the regular edition, I guess I will hope to see if anywhere online such as them list the b/w limited edition version too fpr us people outside the US! I ordered my B&W through TFAW.com. But I would rather grab one from David in Feb at NYCC! Amazon lists it as the h/c as well. Maybe David will need to quantify if the online listings currently up are for the regular edition or the limited? Will there be any difference in the covers for example to easily tell via listings? Ah, it's all so confusing. And I thought I had a hard enough time getting the first sketchbook originally heh. johnpotten: Yes, the details with ASP have been ironed out. I *think* Diamond will request stores to do an "order adjustment" to existing orders for the books that have already been solicited. Mayhem: I would guess that several online retailers like TFAW and mycomicshop.com will stock it once we get it out. Also I'm sure it will be found on ebay. Mouse Guard RPG: a Roleplaying game by Luke Crane and myself. Limited B&W Ed. : a slipcased reprinting of fall, 12" x 12" (same size as the original artwork) all in the original b&w inkwork. i might be beating a dead horse by asking a question that's already been answered a hundred times, but i thought the mouse guard role playing game was out? everywhere i go online says that it's available for pre-order but that it was released in october. my husband is a huge fan and i'm trying to surprise him with the book for his birthday. so the statue for his birthday and the rpg book for christmas. thanks, david! @dpeterson Yes, those events did make us have to realign our thoughts regarding Kenzie. It's hard enough to navigate a comic book's layout and to tip-toe around the slaying of murine enemies. I'll leave the possibility of lesbian mice for another day. Hi David I just picked up this issue(4). Just discovered your work as well. Mouse Guard is great! I've been working away on my own comic, BluBoy. Care to check it out?